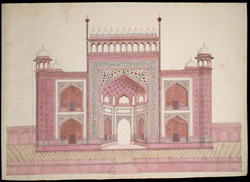 Drawing of the entrance gateway to the Taj Mahal in Agra, Uttar Pradesh. Inscribed on the front of the drawing in English: 'The Grand Entrance Gate of the Taj' 1813 water mark. The Taj Mahal is one of the most famous monuments in the world. It was built by Shah Jahan (r.1628-1658) as a memorial to his favourite wife Arjumand Banu Begum, also known the title Mumtaz Mahal (Chosen of the Palace). Work on the tomb began in 1632. The tomb is octagonal in plan, with a high central arch or 'pishtaq' in each of the four cardinal facades, and a bulbous dome on high neck surrounded by four domed kiosks on the otherwise flat roof. The structure itself is brick. This skeleton has been faced with dressed white marble slabs to give the building its distinctive character. These surfaces are then inlaid with coloured marbles and gemstones on both interior and exterior walls. The tomb sits on a marble-faced plinth with a marble minaret at each corner. It is flanked by a mosque to the west and what is described as its 'jawab' or echo to the east, thought to have been used as a hostel for visiting dignitaries to the site. These subsidiary buildings are faced in red sandstone and each roofed with three bulbous white marble domes. This view shows the southern gateway. It comprises a high central arch flanked by smaller recesses on two storeys. Its red sandstone surfaces are further decorated by inlaid coloured marbles in floral, geometric and calligraphic designs. The inscriptions around the central arch, which are taken from the Qur'an, ask the reader to 'Enter Thou my Paradise'.